Gawd, I have missed cooking! This is what dinner looked like in its raw form. It’s simmering on the stove as I type and my apartment is starting to smell absolutely wonderful. I made myself a promise today as I was slicing and dicing: On Saturdays, if I am home, I will cook legit food. I realized that with Fridays off, I can squeeze in my dates AND grocery shopping. This makes me happy. 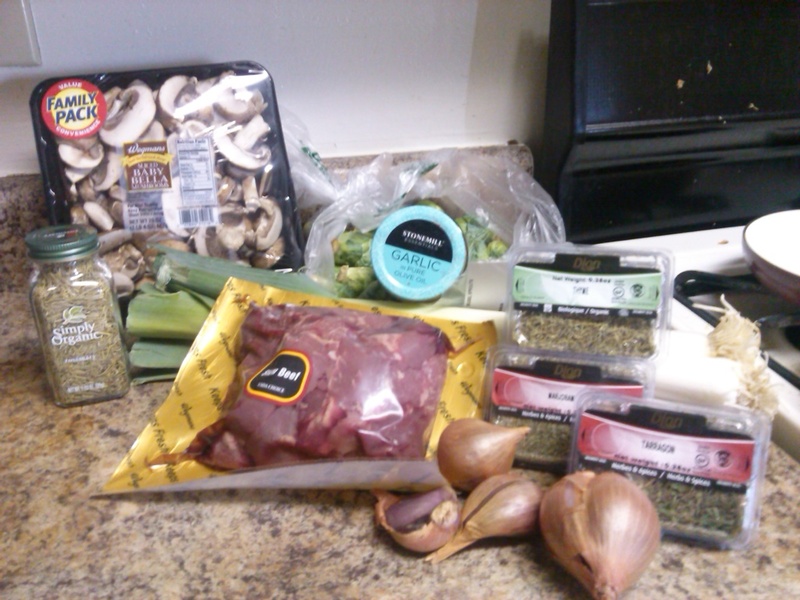 As a bonus, I only used one of those leeks in the stew. The rest have been sliced and will magically transform into potato leek soup tomorrow. Because I have potatoes. And leeks. And a crock-pot. Although I may cook it on the stove top. The largest pot in my new cookware set is quite a bit smaller than the large one in the old set. This is not a complaint. My people do not like leftovers so much, and we were throwing away a lot of food. Smaller pot size means I cook less volume, because I am one of those cooks who say “a pot of xyz” and actually mean a full pot of whatever. This was effective when I was feeding eight folks every night, but now that we are down to five and the missing three include two teenage boys, my economies of scale system needs re-calibrating. There will still be enough dinner for us to eat and also to make a couple of lunch plates. Yay for yummy lunches that don’t include chips and a candy bar. Ok, back to dinner. I chopped the pound of stew meat into bite sized pieces and dredged it in flour and the herbs you see here. Then I browned it in two batches in a bit of olive oil. Then I diced the shallots and sauteed them and some garlic in OO. Sliced the leeks and likewise. And then the mushrooms. I added each of those things to the stew pot as they were ready, and then doused in some red wine vinegar and beef bouillon base. I added water to cover and set it to simmer. The remaining herbed flour is ready to go as a thickener if I need it. I’ll be serving the stew over spaetzle with sourdough and/or rosemary garlic rolls. I’ll roast the sprouts a little later when we are almost ready to eat. You will note that there are over a pound of mushrooms in that package. I used them all. I told the kids I was making beef stew, but in reality this is probably best categorized as mushroom stew with a bit of beef for flavoring. Because it’s better for us to eat less red meat, and also I love me some mushrooms. I got the biggest, meatiest looking ones I could find. Now, if you’ll excuse me, I need to figure out what I am cooking next weekend, and then take a shower. I probably need to do some laundry as well. I’m able to admit I am having difficulty developing a system for it now that I don’t have personal machines anymore, and can’t just throw in a load whenever. Bet it smells live heaven at your house. I’m so spoiled now with laundry at home. Of the years of my twenties, I never had a laundry pair and for a while had a washer only which comes with it’s own problems. I love not thinking about laundry, but must admit the sort-fold-put-away bit is seldom done in a timely fashion.